Yet Another Traveller Blog: The Starship Geomorphs book is finally complete! Whoa.... Fantastic Effort. An awesome tool for an Referee. Thank you for creating this. What a fantastic and flexible resource for the busy Referee! This will come in very handy, thank you. Bravo! Thanks for making this available to the community! Thank you for making this freely available. I know I'll use it, maybe even this weekend! Truly a labor of love. Thanks. Dude, you should consider a Patreon account or at least a tip jar. Outstanding! Thank you so much. Seconding the idea of a tip jar or something. One erratum to point out -- 169 and 409 should refer to *martial arts. Thanks for the catch. I've probably reviewed this thing a dozen times of the last couple years and literally within five minutes of posting it online this morning found four errors. Reminds me of the time I was working on some architectural drawings and called out for "duckwork". I've marked it on my to do list for the next release. It's always something! Happens to me all the time. Looks great! Has anyone thought of making an art pack for any of the computer mapping tools? Nice work! Maybe one more page of tram geomorphs to allow for routing & tunnels (such as going between one and two lane areas, and tunnels for the 3-square-wide trams as well as the 2-square-wide ones)? Though that's a very minor thing. You have made my day! Thank you! As others have said, fantastic work! You should charge for it or at least allow us voluntarily pay something. What tool(s) did you use to create this? Absolutely amazing. I'm enjoying just looking over the maps. I don't suppose there's a chance of getting the raw image files, and/or a version without squares and/or with 3' hexes (for GURPS)? While it would be easy enough for me to print these without the grid, it takes about 12 hours to print the whole set plus another 10-12 to add the hyperlinks. I experimented with this a bit and when I do the next major reprint I could export the files with layers on, so it would be easy for users to turn off the grid. That would have the added benefit of users being able to turn off room names for blank maps and turning off shading to save on ink. I just experimented with a version with both a standard and hex grid, but then the user would have to go through each sheet and turn off the grid they don't want. I'll keep thinking about this, but I'm afraid in the short term I can't help. Fantastic book. Thank you so much. 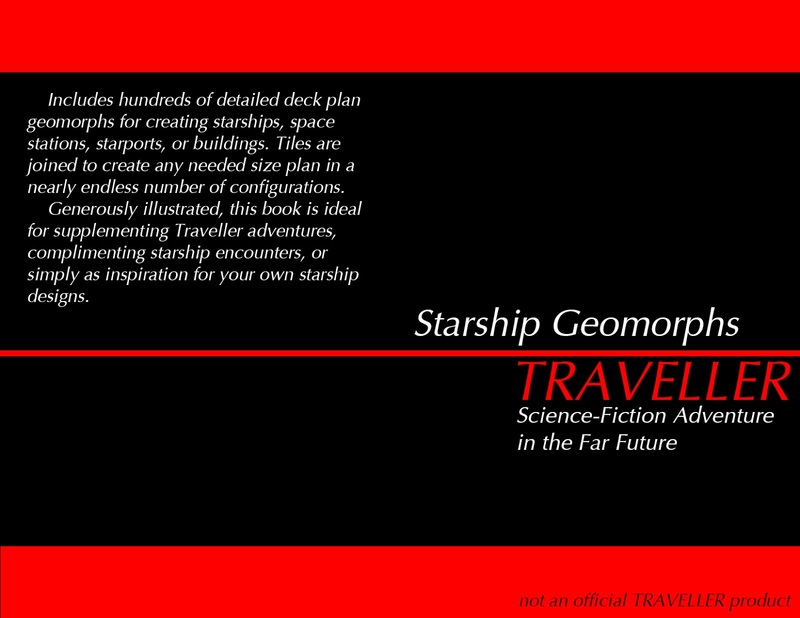 Will make demoing Traveller at cons much easier to plan. Like others I would suggest a Donate button or some other format to allow us to buy you a beer / coffee /1oot Scout. Astonishing. Thanks very much for your generosity. I would gladly donate if I could. Can anyone recommend software to cut these geomorphs and paste them together electronically? My graphics skills are woefully out of date. No need to donate, thanks. It really depends on the tools at hand. Assuming you are using a PC, you can use the Windows snipping tool to clip out the geomorphs you want. Try to clip them right down the middle of the wall for cleaner connections when assembling. In most word processing documents you can add images, rotate, and scale them. In Microsoft Word you need to go Insert > Picture for each image. Then right click on each image and set Wrap Text to something like Through, Behind Text, or In Front of Text so they can be moved freely. Amazing. And generous. You sir are a credit to the hobby! This is truly amazing. Is there any way to export the images as svg or some other portable vector format so that they can be easily printed/scaled/pasted? pdfimage can't extract the artwork due to the way it was generated while gimp/screencaptures loose resolution due to raster vs vector manipulation. Also, a reference tagline as in "Artwork created by ....." with the information you want us to include so that you get proper credit in anything that uses your material would be really appreciated. Since AutoCAD drawings are a vector format, I understand this is technically possible, but requires Adobe Illustrator and SVG converters I don't have and would probably triple the production time. In a better universe I have mad Illustrator skills and this wouldn't be difficult. I'm not too concerned with use of taglines for the artwork. So long as people aren't cropping off my initials or taking claim or charging for the work I'm pretty much happy just to know that people are getting some use out of it. Links back to my blog are always appreciated, but not necessary. This is a relatively small community and word of mouth seems to be doing pretty well. I have programs that convert between varios formats. If you have a sample of your work I am willing to try the conversions for you. I have been able to extract all the graphics, as vector graphics/svg graphics. Currently each page is a single SVG file. From there, in a svg editor, you ungroup the page elements, select the graphics you want, copy/paste onto a new svg document and edit as needed. For example, I have removed all the grid lines from the modular cutter page to replace with hexes. So, if Rob is ok with this, I will post the svg files onto a repository so everyone has access and can modify as they desire. I also have the software to convert the svg to dxf for import into cad or profantasy style programs. I am willing to post this up as long as everyone is ok with this. Absolutely terrific work - can't wait to use 'em! Got the link from /r/traveller. Thank you very much. Absolutely amazing set of deckplans. And the "colour" illustrations scattered throughout the product may even be worth more than the plans themselves for giving players an immersion into the gaming world. I saw that on the Hero Games forum. Thanks! Superb work here. Many thanks for this. A huge amount of work, thank you very much! Sir, you have just been awarded the Starburst for Extreme Heroism! This is the most amazing and useful thing ever for Traveler or Sci-fi GMs out there. A big thank you. Great job. It is fantastic. Thank You for the level of effort put into this. Great work! Beautiful work Robert! Thank you! Amazing! Please, please, please LULU this! Many thanks! This is an incredible resource and a real joy to read. I especially like all of the suggestions for using the geomorphs. As so many before have said - you sir are a saint, nay a knight, or perhaps a master. Thank you, thank you, thank you. damm, this is impressive work. congratulations. Unbelievable. You have provided a top-quality resource to the Traveller community, free of charge. I commend your creativity and effort, and also your amazing generosity - thank you! I have to say, this is easily one of the better Trav products that I've seen in years. Well done. Thanks for this amazing resource!